Despite nursing a fracture, Major Somnath Sharma refused to stay behind while his men were sent on a mission. Elements of 161 Infantry Brigade were sent out to guard the various approaches to Srinagar. In the meanwhile, reports were being received that the raiders were infiltrating towards Srinagar from different routes and that one such force was heading for Badgam, a village about eight miles south-west of Srinagar. The village was less than two miles from the airfield. An enemy force lodged there could easily threaten it. A force consisting of two companies, ‘A’ and ‘D’, of 4 Kumaon, under Major Somnath Sharma, and a company of 1 Para Kumaon under Captain Ronald Wood were sent to Badgam. Major Somnath Sharma was a seasoned soldier who had seen much of the bitter fighting in the Arakan, in the Burma Campaign of World War II and had already been mentioned in-despatches. His left arm was heavily plastered, the result of a fracture, sustained in a fall while doing gymnastics. Major Sharma was ordered to commence thinning out from the Badgam position from 1330 hours. At 1400 hours Major Sharma reported that ‘A’ company had moved back towards the airfield. The Brigade Commander, Brigadier L. P. Sen, DSO told Major Sharma to hold on to the position for another hour and to commence withdrawal from the position from 1500 hours. Major Sharma confirmed that Badgam continued to be quiet and peaceful. There was no indication whatsoever of what was going to happen within the next 30 minutes. Half an hour after ‘A’ company of 4 Kumaon had left, the group of villagers in the nala began to move around and to disperse nonchalantly in different directions around Major Sharma’s company. The unsuspecting Kumaonis took this movement to be the normal ‘dispersal’ of a group of people towards their homes. They had no idea that these were the cunning raiders disguised and posing as Kashmiri villagers with their weapons hidden under their loose cloaks. They were, therefore, taken by surprise when firing commenced from the houses in the village and when a mortar opened up on them followed by light machine gun fire from close range. Faced with fire from the village Major Sharma reported that he was hesitant to return the fire for fear of killing or injuring women and children. While Major Sharma was reporting the changed situation to the Brigade Commander and how he was coping with it, his company consisting of less than 90 men was attacked by a large force from a depression to the west of his position together with mortar and automatic fire. Under assault from three sides, ‘D’ Company began to suffer heavy casualties. Outnumbered 7 to 1, Major Sharma did not lose heart. Although the Brigade Headquarter had informed him that 1 Punjab was coming to their aid, he knew that their arrival would take time. With utter disregard for his own safety he moved from one section to another cheering his men and motivating them. The men were greatly inspired by him and continued to make the enemy pay a heavy price by killing as many of them as possible. When he discovered that the casualties were affecting the functioning of the light machine guns, he began to fill the magazines himself. It was while he was so engaged that an enemy mortar shell landed near him killing him on the spot. Besides Major Sharma, the company lost Subedar Prem Singh Mehta, and 20 other ranks. 26 were wounded. Enemy casualties were heavy. When Badgam was recaptured by our troops the bodies of over 300 tribesmen were counted. 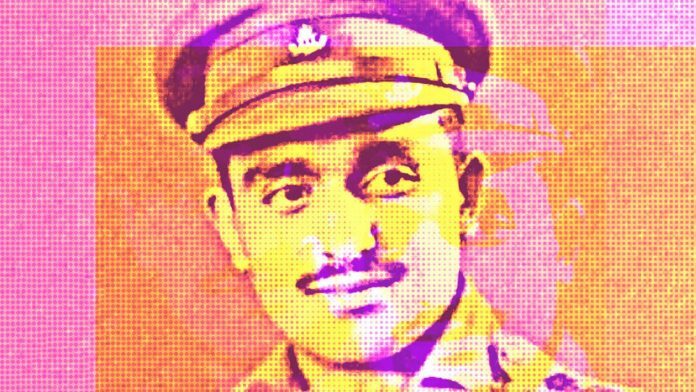 Leadership and gallantry of a very high order was displayed by Major Somnath Sharma and the Government of India responded by awarding him Independent India’s highest award for gallantry-India’s very first Param Vir Chakra. 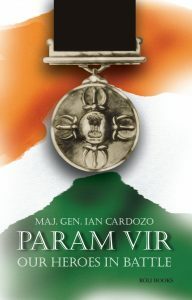 This excerpt was taken with permission from the book ‘Param Vir: Our Heroes In Battle’ by Maj. Gen. Ian Cardozo. It was published by Roli Books.